I study species interactions, and have a particular interest in the role that plant-animal interactions play in the evolution of plant traits and reproductive strategies. 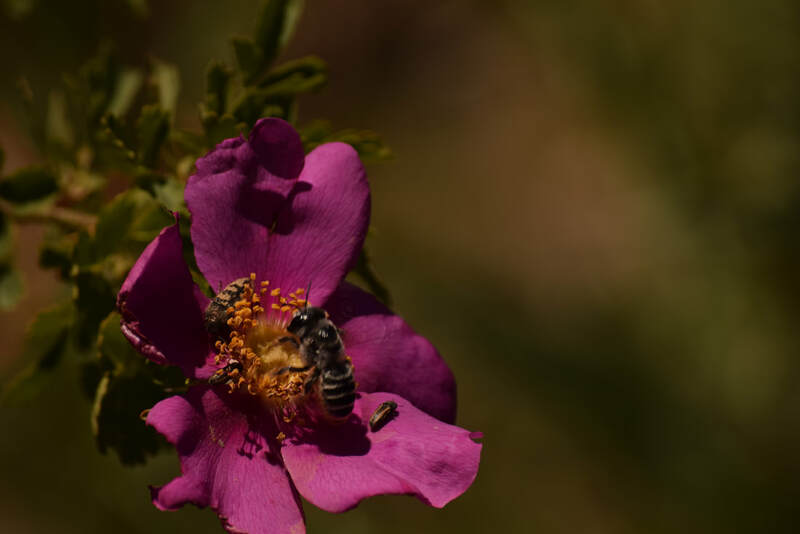 My current focus (my dissertation work) is on the ways that floral rewards help mediate the cost-benefit balance in plant-pollinator interactions. In my thesis I am addressing the questions: How do plants balance the benefits of pollination against the cost of providing nutritional rewards to pollinators? Why do some plants offer pollen as a reward to floral visitors? How do pollen-rewarding plants resolve the conflict between the need to reward pollinators and the need to defend pollen against non-pollinating herbivores? & Why does nectar robbing often result is commensal rather than antagonistic outcomes? The majority of animal pollinated plants provide a reward to their floral visitors. This may take the form of nectar, resin, scent, or even pollen. The particular reward type, or suite of rewards, offered by a plant species may be viewed as a "reward strategy". Any given reward strategy will have some associated costs (opportunity, metabolic, competitive, etc), which should be balanced against the benefits conferred by floral visitors seeking the resource provided by the reward. What selective forces drive plant lineages toward these alternative reward strategies? In particular- why have some plants evolved to offer their own male gametes as pollinator rewards? I am addressing this and related questions with two species of bee-pollinated lupines- Lupinus bakeri ssp. amplus. and Lupinus argenteus. All lupines are nectarless and pollen rewarding, making the genus ideal for testing questions associated with the pollen reward strategy. Plants modify their interactions with animals through the production of a diverse array of chemicals (secondary compounds). Many plants express secondary metabolites commonly associated with herbivore defense in the nutritional rewards provided to pollinators (nectar & pollen). While our understanding of the ecological significance of nectar secondary compounds has benefited from increased attention in recent years, the importance of pollen secondary compounds for plants, pollinators, and their interactions remains virtually unstudied. In an effort to better understand how the pollen reward strategy interacts with the need to defend reproductive tissues, my collaborators and I are comparing alkaloid profiles across the above ground tissues (including pollen) of three lupine species Lupinus argenteus, Lupinus bakeri ssp. amplusI, and Lupinus sulphureus. Many plants with tubular corollas experience visitation by animals which collect nectar rewards by piercing holes in flowers and removing nectar without transferring pollen. Visitation by these "nectar robbers" is often detrimental to plant reproductive success - via damage to flowers, and deterrence of pollinators. However, in many systems, nectar robbers do not seem to exert any negative effect on plant reproductive success. Why are nectar robbers so often effectively commensals rather than parasites? I am performing a series of experiments and observational studies in Corydalis caseana to provide some answers to this question.